Yes it’s been a while since I’ve posted a rant! Let’s do this…. You may have seen Twitter’s recent announcement about the new “stickers” feature which allows you to add emojis and other things to your photos. Fortune points out the obvious play on Twitter’s part to keep up with Snapchat with a headline that gives the new feature a positive spin. Meanwhile the Wall Street Journal is completely and inexplicably oblivious to the chasing of snapchat with a slightly-less-than-flattering headline about Twitter…. Note in particular the second paragraph in the WSJ article about the other “communication” apps with stickers. C’mon…. Really? ZERO mention of Snapchat there? That’s amazing. I’m not totally sure how I feel about stickers yet since I haven’t used them but I have plenty of thoughts and you can look at this from a few different perspectives which we’ll get to. Meanwhile as photographers the ongoing debate of whether iPhone pics and the ease of entry is “ruining” the industry is an interesting one to us. This article on Popular Photography while not overtly addressing the big picture in that regard seems to come from that mindset, claiming that using Twitter stickers is a way to “completely ruin your photos”. I always find these types of opinions a little troubling. We’ve always embraced the idea that the more people appreciate everyday photography the more they will appreciate professional photography. 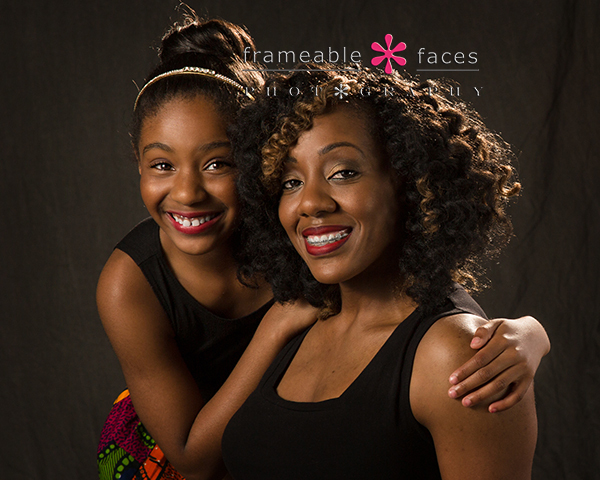 We’ve always looked at Snapchat and Instagram as opportunities to have fun just like everyone else and we actually use them to highlight aspects of what we do at Frameable Faces. To call attention to stickers being a way to ruin pictures is silly to me. If you take a picture you don’t want to ruin with a sticker, then DON’T ADD A STICKER…… duh. Right? Maybe the fun you can have with stickers can help you build community to draw people in to see the stuff that is meant to stand on its own without the stickers. We actually covered this topic today on our photography show “The Photo Shop” on @ParachuteTV1 on Periscope if you’re interested in taking a look. Facebook hashtags Good try Facebook but you are NOT twitter. Hashtags totally flopped on Facebook – they just really don’t belong there in my opinion. Periscope sketch Rolling out the ability to sketch on the screen while you’re broadcasting was, well…sketchy. I can only conclude that this was a way to chase Snapchat (?) even though the two are completely apples and oranges. Sonia Figueroa is the only scoper I’ve seen who consistently makes me smile when she draws hearts on the screen to “give them back” to her viewers (she’s one of my faves), but at a time when everyone was waiting for other more practical features this was a bit of an annoyance. So there it is… had to do it. Thoughts? Are you using Twitter stickers? Can you think of other app fails from apps chasing apps? Please comment, share your thoughts, and share this post! The Doug and Ally Morning Show on Periscope! That’s usually how we start our morning show with those Larry Sanders Show / Howard Stern inspired words, and off we go…. 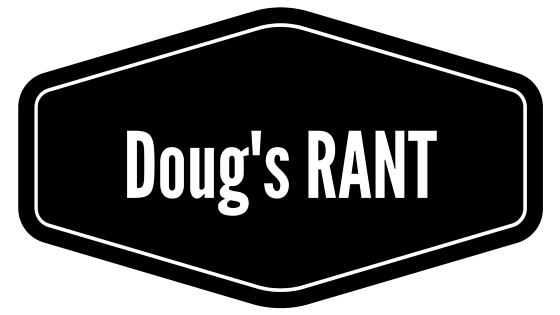 The Doug and Ally Morning Show! 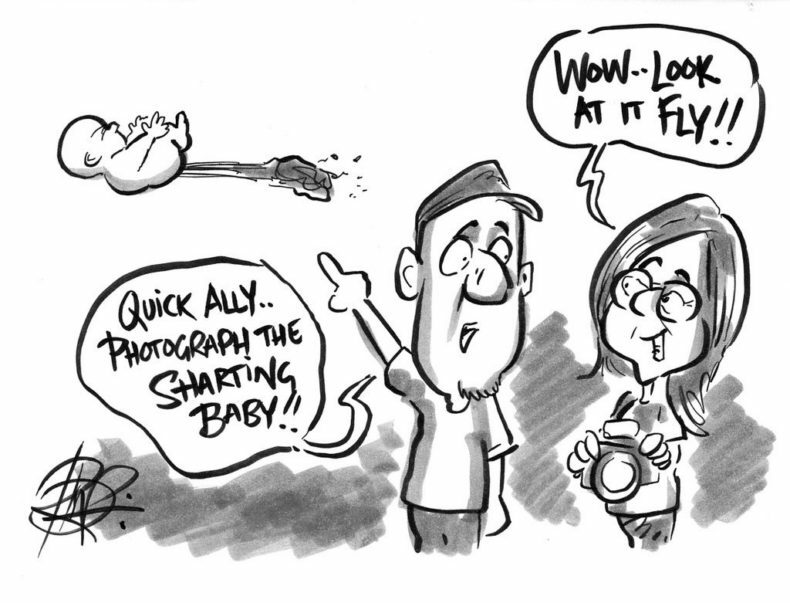 We have been broadcasting live on Periscope since April 2015 and somewhere along the way the “Doug&Ally Morning Show” became a thing. It wasn’t planned. It was early on an October morning, we weren’t doing much here at the studio and we thought it would be interesting to jump on Periscope and see who was up! We don’t officially open until 10:00 AM anyway. Turns out a lot of people were happy to see us on and someone made the comment that it’s like a morning show… We thought that sounded fun so we kept doing it and here we are 8 months later going strong with the morning show “officially” Tuesday through Fridays from sometime around 8:45 or 9ish until 10 or 10:30ish. It starts when it starts and it ends when it ends…. Meanwhile many things have happened along the way that have become regular occurrences / features on the show… One of the most well known guests is an amazing caricaturist from the UK named Rich Nairn (@RichNairn on twitter and Periscope) who has been known to join the show and tweet doodles based on what’s happening. He sketches them in black and white but he made a color one which has become the official artwork for the show and will be available on T-Shirts (and maybe coffee mugs) very soon! The phrase “You shut up, you shut up, and you shut up” has been an inside joke in Ally’s family which originated with her dad and it has become a common phrase on the show… haha! Notice the Periscope hearts going up the side to the right! Here are a couple more of his from the show…. So we were talking about this session and then Rich tweeted…. 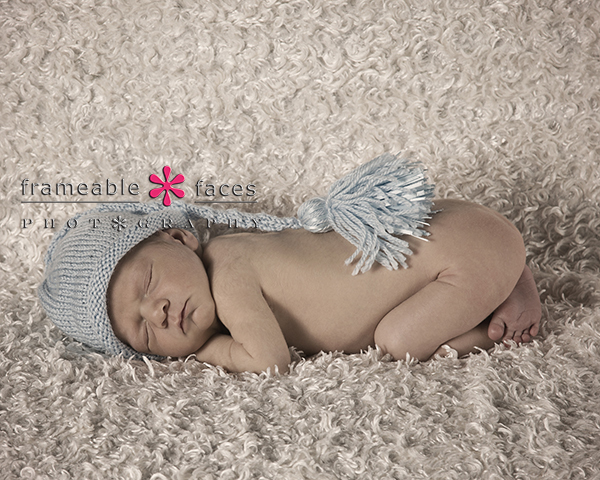 He really is amazing – he cranks these out in minutes…. Check out his fantastic work at his website The Artful Doodler! 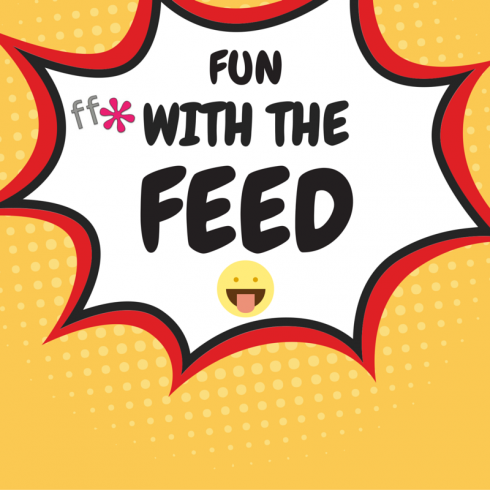 I noticed that the thumbnails that show up in the Periscope news feed are sometimes amusing because they capture candid expressions of the person broadcasting and they refresh every few seconds, and so “Fun With The Feed” was born – with it’s own logo, jingle and everything! No one knows when one of these might happen (nor do they know if they’ll be the next victim…). 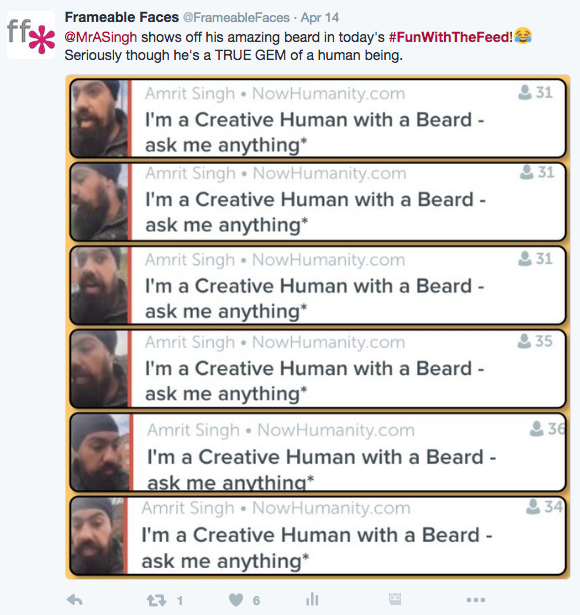 @Amrit Singh has an awesome beard so we thought we’d help him show off all angles of it. Meanwhile the guy is awesome and has been doing some amazing humanitarian work in the UK helping with the refugee crisis. We met him in San Francisco in January at the Periscope Community Summit (now called Summit Live). So join us! There are plenty of features like “the coffee test” and spontaneous shenanigans that happen on the show and you can be a part of it just by tuning in and commenting! We have a ton of fun and we love our international community who joins us literally from all corners of the world (Russia, Malaysia, Israel, UAE, Brazil, Serbia, Japan, Australia, UK, Spain, France, Morocco, Venezuela, Turkey, India, Pakistan, Ukraine, Germany, The Netherlands, Nigeria, just to name some) every Tuesday through Friday morning (and sometimes Saturday) for the Doug&Ally Morning Show!!! Excitement For Elona’s Return to the Studio With Her Mom and Dad! 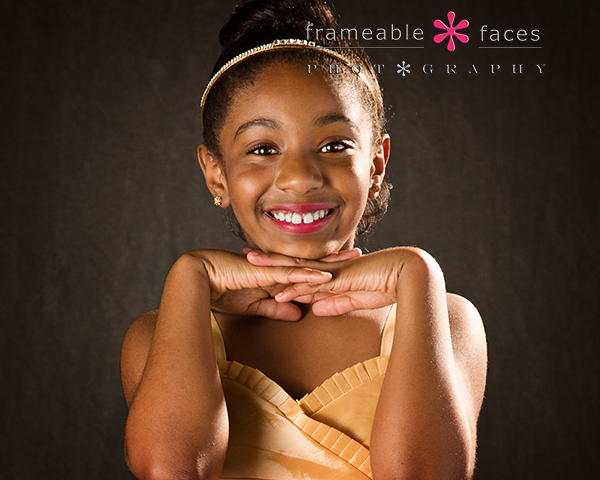 You have probably seen the canvas of the beautiful little dancer on the wall by my desk in the studio if you’ve spent time here at Frameable Faces. 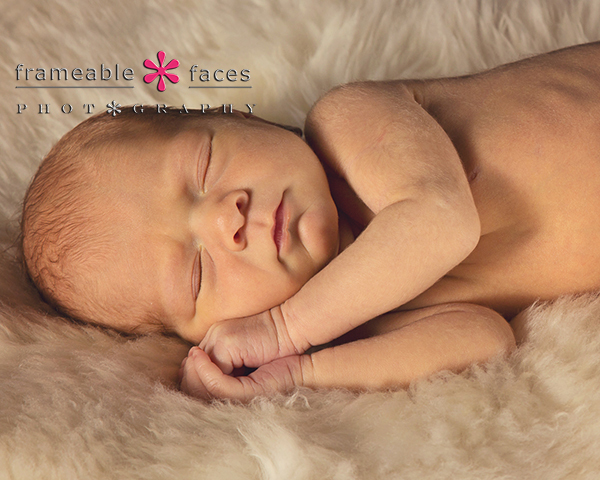 That’s Elona – one of our favorite little cuties in Frameable Faces history! We love when she comes by to visit every now and then – she is one of the brightest kids we know and she never ceases to surprise me with her insights every time we have a conversation. 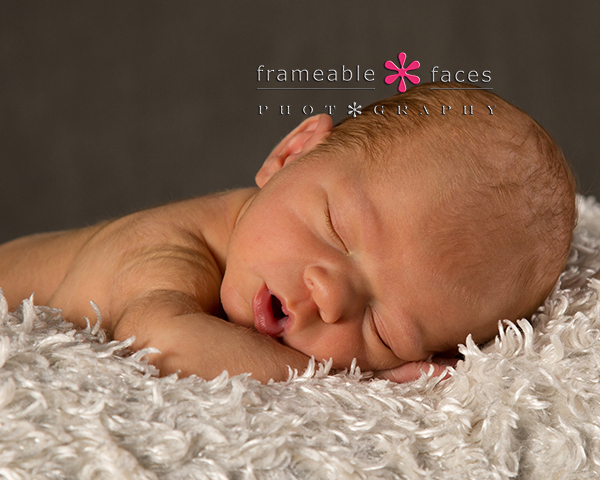 So when we got the call that she would be coming to the studio for a photo session we got very excited indeed! 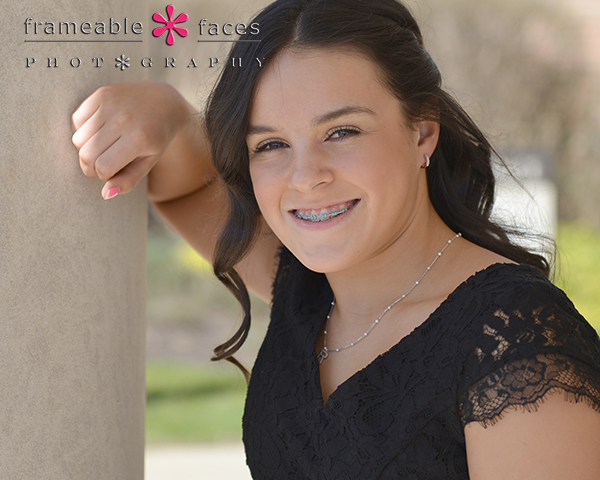 She is always a delight to photograph! 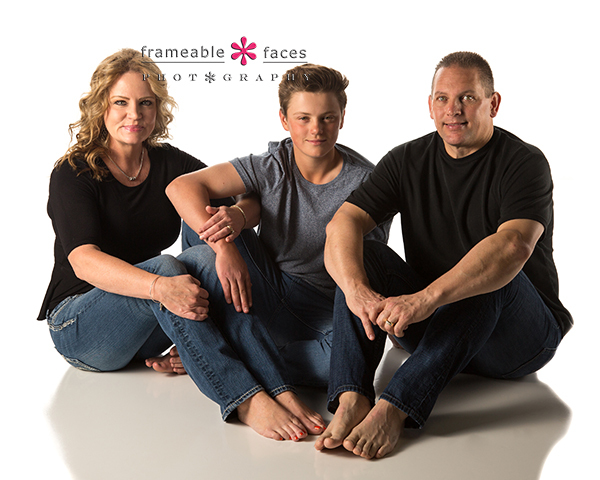 We love Elona’s mom Harolyn and her dad Ulrich – they’re awesome and we’ve photographed all of them before so we knew this would be great. Let’s start first with just Elona being Elona! And now we have the extended replay of the live Periscope broadcast on our YouTube channel from the session! 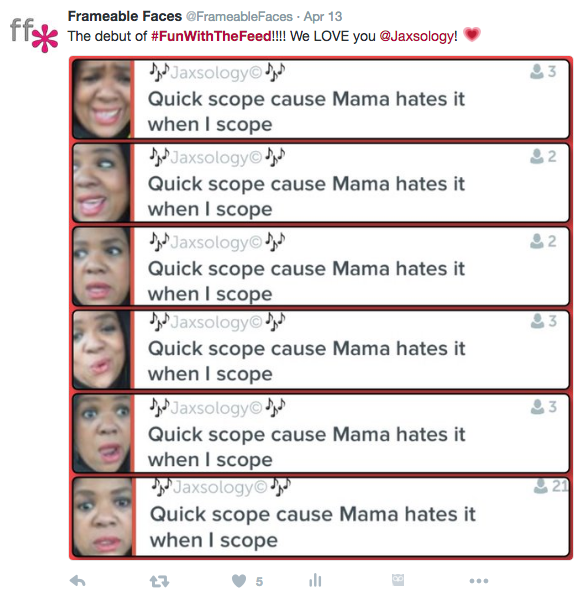 If you have not downloaded Periscope yet you can do so and follow us at @FrameableFaces at this link. 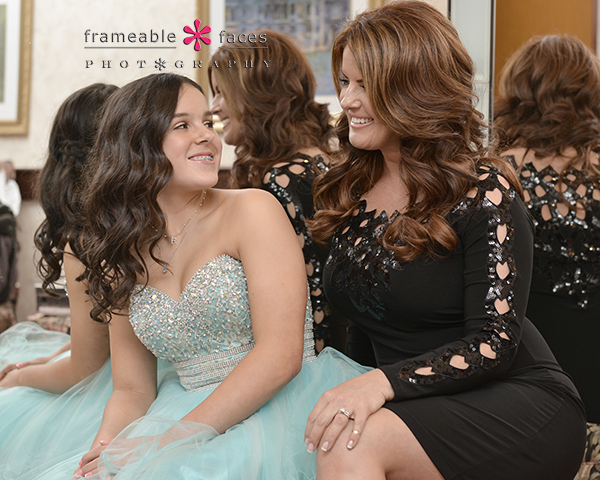 Okay let’s get back to a couple more photos from the session first with a classic mommy daughter image! 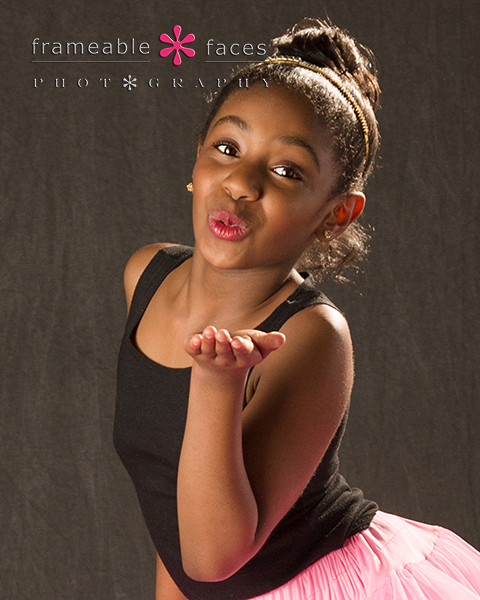 And we will finish it off with one more of Elona blowing us a little kiss to end it! Love that girl! And there you have it! You can see why we we had so much excitement for her return! We hope you enjoyed the highlights of our day with her and her parents! Another Example Of What 20 Years Of Happiness Looks Like! When Dena came to the studio and we started chatting we discovered that we had a couple things in common. A couple mutual friends, sons similar ages – stuff like that. The usual fun stuff. So we got to discussing the session during the consultation with the usual details, what to wear, what color backdrops and those sorts of things. We looked at Saturday May 21st as the date for the session and she said that’s cool – it’s the day after their anniversary. We said cool – that’s two days after our anniversary! “Oh” she said “what anniversary is it? It’s our 20th!” We said “What? It’s our 20th too!! !” How cool! We got married on consecutive days in 1996!!! 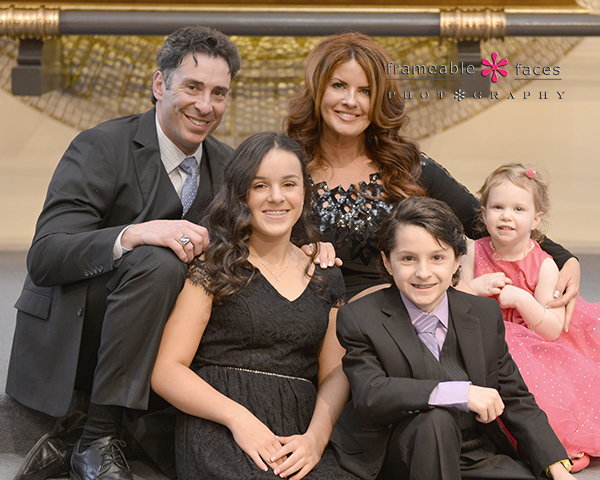 What a great connection – celebrating 20 years one day apart and then together the day after that for a family photo session! We knew this would be fun. Next we have the extended replay of the live Periscope broadcast from the session with a live audience! If you haven’t downloaded Periscope yet you can do so and follow us at @FrameableFaces at this link. 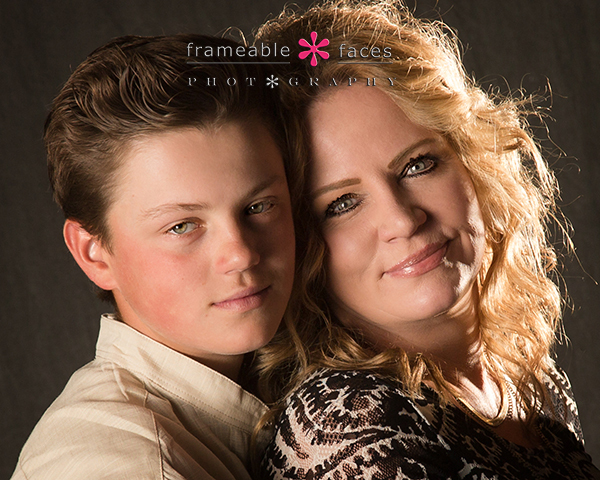 Okay we have a couple more photos to show – first one of a boy and his mommy! How sweet! 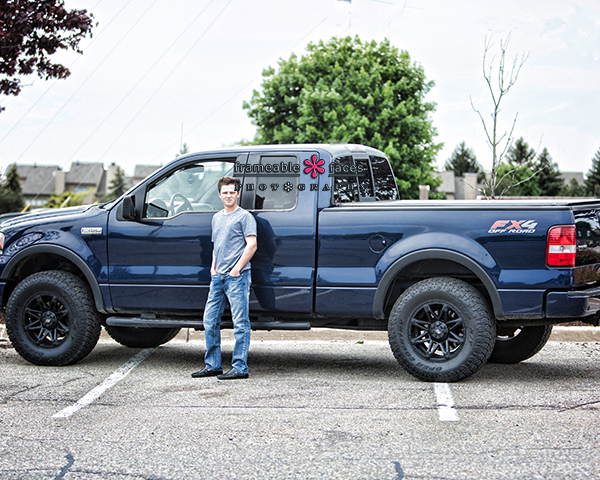 And lastly a dude and his truck! And there you have it! We had a great time with these guys – on a similar path as ours! We hope you enjoyed the highlights of their session! 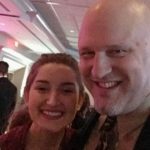 Kickin’ It With Riley At Her Bat Mitzvah! 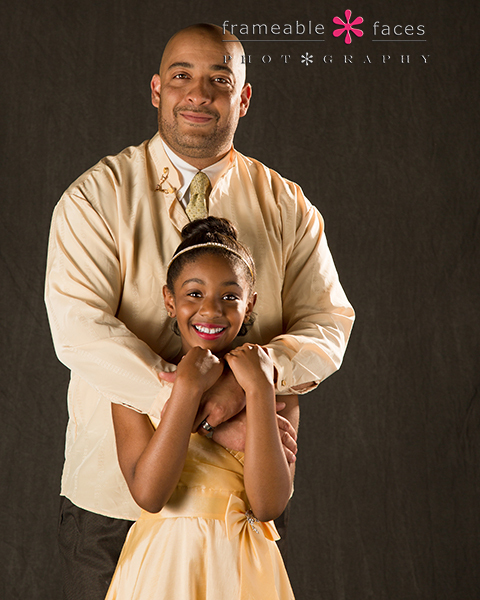 We have known Riley since she was born – she’s actually my Goddaughter, so this was a special day for us. 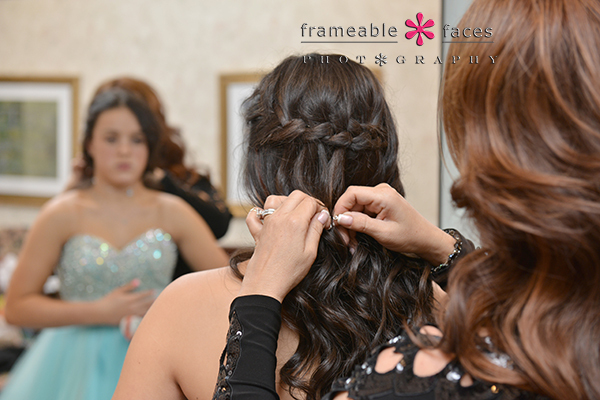 It was also special to have our amazing event photographer Angela there to capture the event – it gives us a warm and fuzzy feeling to have Angela there to ensure that our friends and family will have memorable photos from the event the way they deserve. 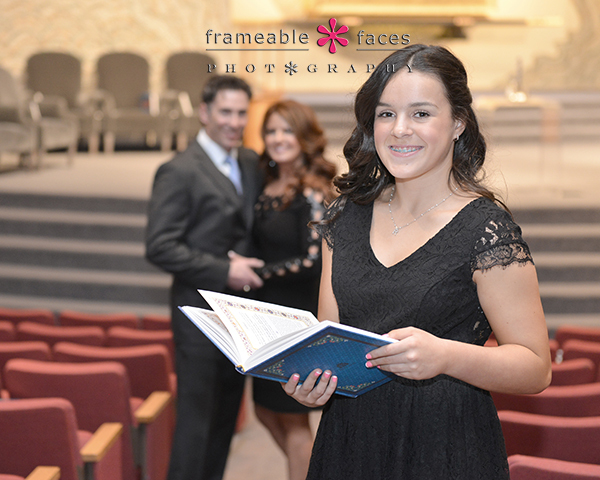 We’ll start with the traditional photos of Riley at the bimah and with her family. 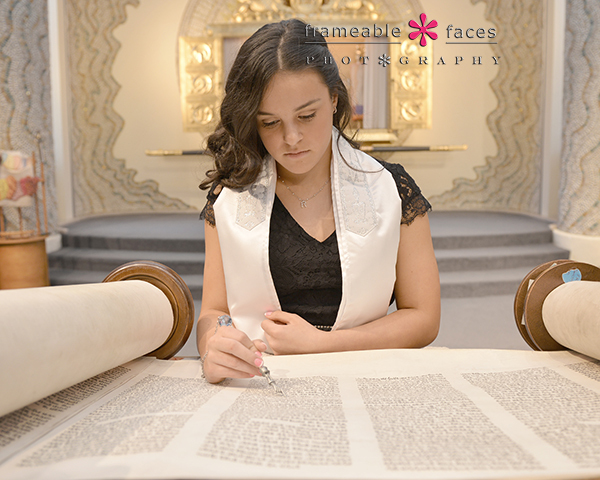 A special moment for a special girl at the Torah! Needless to say we’re a little biased but we love the way our Angela (we love to joke and call her “Nikon Girl” since she rocks a Nikon and Ally is Canon all the way) captures these moments and the composition of her photos! She’s awesome. Next let’s bring in some photos with Riley and the fam… First with proud parents Todd and Monique gazing at her from afar! 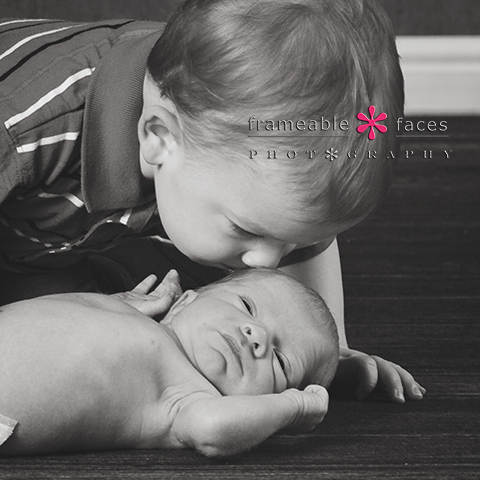 You’ve seen this type of photo on this blog before – it’s one of our favorites every time. 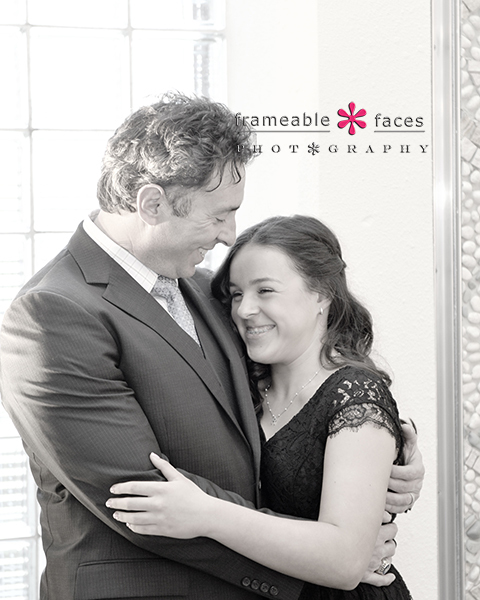 A classic black and white of Daddy’s girl…. And here’s the proud family with little brother Brennan and little sister Sage! The party was awesome and “Kickin’ It With Riley” was the theme since she is a soccer player, and I even captured a shot with my iPhone behind the scenes of Angela at work! 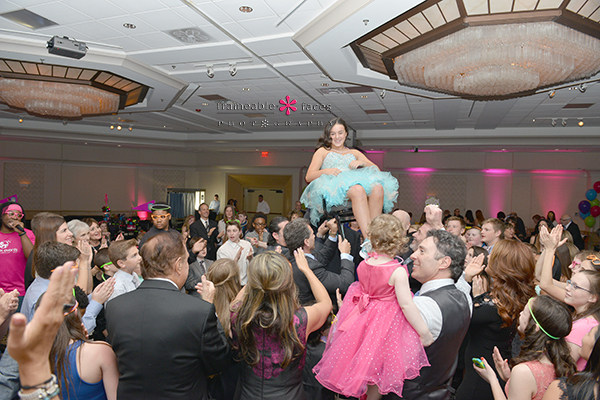 And here is a fantastic photo we’ll leave you with as Riley’s friends and family lift her up to celebrate her as she surveys the room during the traditional hora dance! An awesome way to close out the highlights of an an awesome day! 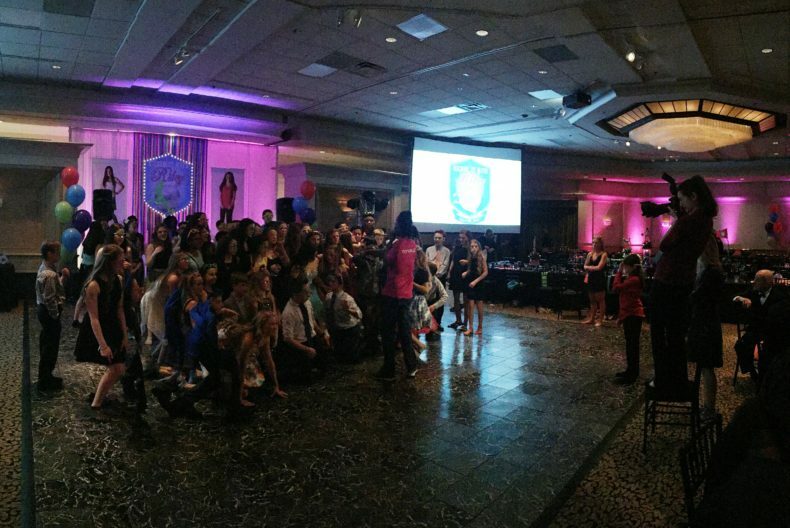 We hope you enjoyed these photos of Riley’s special event!